It’s hard to know what to make of this sort of integrity, one oblivious to the true meaning of what it is opposing, what it is defending and what its costs might be. Mr. Asadi has no idea, when he declines to work for the Islamic regime, that the door he closes behind him will open only into a room with a rope hanging from the ceiling and blood on the walls. He also seems, for much of the book and perhaps even at book’s end, not to appreciate that his dear communism is similarly unforgiving whenever it acquires power and that radical Islam and communism share an urge toward totalitarianism. The Islamic rulers’ honeymoon with the communists is brief; soon a general crackdown is launched. Thus in 1983 begins Mr. Asadi’s descent into a realm of state cruelty that makes the shah-era detentions look like child’s play. His old friend the Islamic cleric, meanwhile, flourishes during this period—and continues to do so today, for the cleric is Sayyed Ali Khamenei, Iran’s supreme leader. Mr. Asadi is so politically guileless that when his arrest comes, he persists for some time in the belief that somehow an American-sponsored coup like the one that brought the shah to power in 1953 is under way. Instead, he spends more than two years being interrogated and tortured by the Islamists. Much of the “intimate cruelty” is administered by someone he calls “Brother Hamid.” Working through all the levels of his hatred for this man is one of the functions of Mr. Asadi’s memoir. Mr. Asadi is beaten, whipped and hung by his wrists for hours at a time, his toes just shy of the floor. Sometimes he is up-ended so that he hangs with his nose in his own excrement. “Brother Hamid transformed me from a young idealist to the lowest form of life on earth,” he writes. Eventually he cracks, but not before absorbing an astonishing degree of brutality, some of it for trying to “confess”—he falsely says that he spied on the regime for the British and the Soviets—without ¬implicating anyone else. Here no one can doubt Mr. Asadi’s extraordinary courage. The book ends with his release after the government apparently decided that he was too junior in the Communist Party to merit further torment. But he emerges into a country where the rulers’ paranoia has not been assuaged by the mass murder of thousands of his comrades in 1988 for their supposed danger to the Islamists’ rule. “Later on,” Mr. Asadi writes, “the collapse of the Soviet Union, a country I had visited at the height of its power, took with it the last fragments of my beliefs. I had freed myself from myself.” He had nothing left, he says, but “love, beer, and literature.” He would continue to live in Iran for 15 years, forswearing political activity and eventually fleeing to Paris with his wife when the opportunity arose. A long-time author, editor and translator, he now writes for the Persian-language news website Rooz Online, which he co-founded. 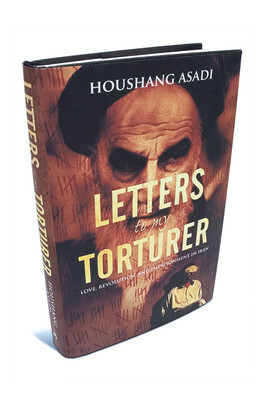 Mr. Asadi’s dispassionate description of his experiences makes the book a permanent addition to the harrowing genre of the torture memoir. “Letters to My Torturer” is further distinguished by its precise anatomizing of the curious closeness that grows between torturer and tortured. “In the end, I began to see something of myself in my torturer, and found myself recognizing him as a human being too,” he observes. This intuition is all the more remarkable insofar as Mr. Asadi has given us an indelible portrayal of the fervent commitment to Islamism that makes his torturer pitiless. There are some bumps in the narrative—it is not clear at some points when Mr. Asadi is addressing Brother Hamid, for instance, and whether some passages were written on command, as part of his elaborate “confession” in jail, or some years later in Paris. He also makes fugitive references to Guantanamo Bay, San Quentin and Israeli solitary-confinement cells, which suggest that, remarkably, Mr. Asadi is not quite ready to draw the distinctions between totalitarianism and democracy that his book so vividly demonstrates. Nevertheless, Mr. Asadi has offered the world a powerful testament to what transpires in the prisons of Iran—a nightmare that the country’s radical Islamic leadership clearly would be only too happy to export. Mr. Rosenberg is a writer and editor living in New York.